Software-as-a-Service is one of the oldest and the most mature of all Cloud Computing options and is still booming with its continuous adoption by many businesses. This week’s WOLF Cloud Sum-up talks about the four questions one needs to ask before moving to SaaS and about the Total Cost of Ownership in this business. According to analyst firm Gartner, the global SaaS sector grew by 14.1 per cent last year to $8.5bn. This higher than average growth rate in an otherwise difficult market meant penetration levels rose to a total of 10 per cent across all enterprise application sectors, with the figure expected to increase to 16 per cent by 2014. Nonetheless, awareness of the potential benefits of SaaS among C-level executives continues to mount as the industry's marketing machine cranks up beyond its more traditional IT audience. This awareness means questions are starting to be raised about promised cost savings, ease of implementation and the ability to wind capacity up and down in line with business needs. But rather than cave into executive pressure and rush in to cloud computing, it is essential that IT directors plan carefully for any change just as they would for more traditional software implementations. As a result, silicon.com has come up with four key questions that IT leaders should ask themselves before jumping in feet first. How can I manage the expectations of the business? How do I ensure the business is not exposed to undue risk? What key licensing and upgrade considerations do I have to bear in mind? Click here to read more on the analysis of these questions and find your answer before moving to SaaS. According to Andy Pattinson, former CIO of Carnival Australia; using only Total Cost of Ownership (TCO) as a measuring unit for deciding between SaaS and On-Premise software may lead to a sub-optimal decision as TCO is just a part of the SaaS picture. On the other hand Return on Investment (ROI) is a more useful criterion for comparison as it is more understandable by business people. The original goal of cloud computing is to make computing more affordable, convenient and efficient. It does not mean an end of the IT professionals though it may just bring about a shift in skill set. With the pace of cloud innovation IT researchers and developers will have more time and resources to dedicate to creative tasks and work towards automation of complex task. Cloud Computing may be a revolution in IT today, but the concept dates back to 1960 when there were predictions that “computation may someday be organized as a public utility”. Amazon modernized its data centers and introduced Amazon Web Service on a utility computing basis in 2006 from where it started gathering pace. Reduced Costs and Capital, Flexibility, Security Risks and Liability are some of the benefits and hurdles that businesses have to consider when riding on the waves of innovation created by Oracle, IBM, Amazon, Google, Apple, Microsoft, Rackspace and other IT giants. 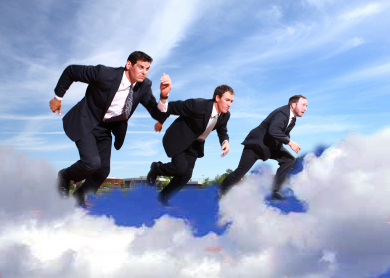 With cloud helping businesses to do more for less, stay tuned for more sum-ups on in the forthcoming weeks.